Prey has gotten a lot of hype over the past few weeks. It’s a new game from Arkane Studios, the developers of the Dishonored franchise, and it is also somehow related to the 2006 game of the same name. Last week, in a move that puts them in a very different place from most other game developers right now, the teams behind Prey released a demo in order to get people excited about the full game next week. I am not a person who knows anything about Prey. I haven’t read any promotional material, I haven’t watched any prerelease video, and I haven’t checked out any interviews with the development team. I have been wholly in the dark about the game, and with that profound ignorance I walked head-on into the Prey demo. There are lots of games out right now that have figured out how to do tension in a game. From Alien Isolation to Resident Evil 7, contemporary videogames have maneuvered their way into understanding how to make a player feel a certain kind of anxiety about the world that they are navigating. We often call those games “horror” games, but sometimes I wonder if that’s the best way to describe it. These games are about holding out on the player until the last moment, and in that last moment, scaring the hell out of them. The Prey demo has its share of those moments, but like the first and second Bioshock games, those moments that we describe as horror are sublimated beneath layers of dialogue, environmental design and puzzles. 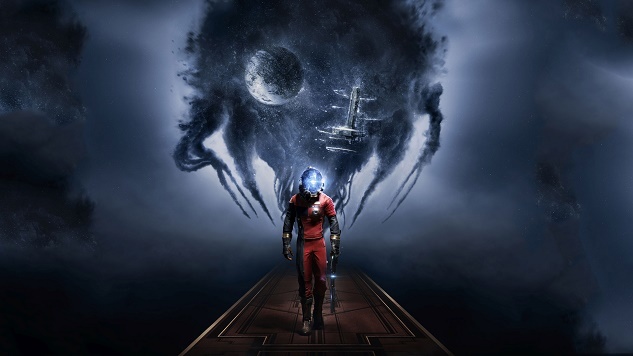 Prey is in the lineage of Looking Glass Studios, one of the progenitors of the so-called immersive sim, and therefore plays with the push and pull of player expectation and possibility. Put another way, Prey seems invested in giving the player options in its game world while also playing with their expectations about what those options should produce. After playing through the demo, it is my suspicion that Prey might give us the chance to finally talk about a different genre of games: the thriller. While we sometimes have games that fit into this category, such as Heavy Rain or Gemini Rue, it is far more often to see games categorized as either horror or action, as if the tense genre of the thriller doesn’t exist at all within the world of games. And that’s a shame, really, because it seems clear to me that games need their Zodiacs and their Black Swans. I yearn for high tension married to smart drama, and a world full of computer screens to read and items to combine to solve environmental problems seems to be the perfect place for that. The story that Prey is telling leans into the thriller genre completely. Without spoilers (and after all, everything I can “spoil” is in the first hour from a free demo you can play right this moment), it is very clear that this is a game that is invested in presenting the player with fractured information at all times. The opening few minutes of the game are quickly revealed to be a lie (well, some of it), and over the course of the hour that I played I had the distinct feeling that many people and entities that I was going to meet over the course of the full game would be either lying to me or giving me half of the information that I needed so that they could manipulate me. Moreover, the theme of deception is embedded in the bones of the game, as the sole enemies that I fought over the course of the demo were “mimics” who would attack me, jump past, and then “hide” as objects in the game. The player turns around and they have to do some quick thinking: Was that phone there before? What about that box? Any of them could be a mimic now, and danger is in every situation. It’s a paranoid existence for the immersive sim player, which is really just a set of mechanics that means you’re going to spend a lot of time rummaging around and picking things up to solve your way through the game. On one hand, that fear of what is next feels very much like something in the vein of the Bioshock or Silent Hill franchises. That is to say that the way the game presented its partial information (and the revelation that it was partial) felt very familiar to me, a person who has played all of these games that are getting referenced. On the other hand, and this is the important one, all of those methods date back to 19th century novels like Jane Eyre and The Woman In White and 20th century films like Psycho and The Conversation. The history of the thriller and all of its information control is long and varied within every other medium, and the release of Prey might be the time to fully grab that genre term and wrangle it for the videogames world. Of course, the necessity of the term will have something to do with what the final product looks like. The demo has lots of nods toward a lot of different ideas of what is happening in the game, and many of those nods are predictable and boring if they end up being the “revelation” at the end (a book about creating realistic dialogue from a corpus paired with a video of a speaking character had me feeling like I had too much information very early, for instance). Whether it ends up successful or not, I hope that we don’t merely flatten Prey into its mechanical identity as an immersive sim and ignore its actual genre. Likewise, I hope that players and critics don’t mistake getting scared every now and again for being solidly in the horror genre. As a game that is focused on making the player wary and unsure about their surroundings, I hope that the paranoid genre of the thriller can help us make sense of the full game.